Happy Tuesday! Did you get to have a three day weekend? I forgot that it was President's Day yesterday because I still had to work as usual. Unfortunately, bank holidays means that daycare is closed too. Boo. Hopefully DH didn't mind taking her into his office. Note to self, update calendar phone to notify me of bank holidays! 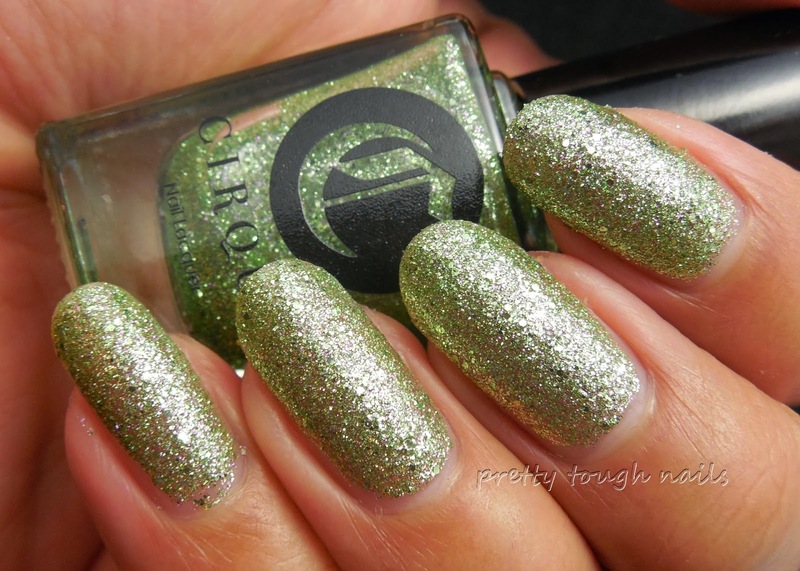 Today's post will feature two textures that were released by Cirque Polish in her earlier collections. I think Cirque is incredibly innovative when it comes to finishes and colors, and possibly she was one of the first to release a textured polish before the polish world was ready for one. I looked up some of the swatches of today's colors and most posts show the colors with topcoat, which is what everyone did with gritty polishes. I'll have today's posts in their original finishes. The first polish is Hellebore, a lovely light green texture with yellow undertones and a sprinkling of lavender microglitters. This was released as part of the Objets d'Art collection and I believe it was the lone texture in that collection. I used three coats here, and had slight difficulty navigating the brush to reach the towards the cuticles. That's probably normal for most textures. It dried in good time, about 15 minutes which is slightly longer than normal polish but not terribly long. The purple microglitter is hard to see from afar, but they're visible up close. Next I have Dark Horse, which was released in the first collection named after it, Dark Horse. This is a black textured polish with glints of blue and pink. This particular one was harder to manage than the previous texture. The density of glitter was sparse during application, which means loading up the brush is needed in order to get a decent amount of glitter with each layer. I used four coats here while allowing time to dry in between coats, but the overall look is still a bit patchy looking. Not my favorite to apply, that's for sure! I didn't like the patchiness of Dark Horse alone, so I used a layer of Gelous followed with topcoat to see if the glitters would be enhanced. It does somewhat, but still not enough to make this polish worth the hassle of application and dry time. I do like the charcoal appearance of this texture, but it's not enough for me to want to wear it again. I'm going to chalk up the difficulty of application and end result as a test phase for texture polishes by Cirque. She may have inadvertently came up with a texture polish, but it may have set the trend for more to follow. When do you think the first texture polishes were released, and by whom? Hellebore is a lovely shade of green and Dark Horse looks awesome with top coat. I love your close up shot of it. Dark Horse is definitely complex and enjoyed most when viewed head on.... I'm glad I got a good shot of it! I really like that one a lot too! !